How is The Mid-Autumn Holiday in Vietnam? Vietnam is known as the country accumulated many beautiful festivals. For example, besides the Tet Holiday, the Mid-Autumn holiday is one of the most important holidays. It is a traditional celebration for Vietnamese children andit is celebrated for a whole day. The Mid-Autumn is held on the 15th day on the 8th lunar month (often in late September or early October) in the middle of autumn. Travel Sense Asia offers a huge of brief information in this holiday for foreigners. On this day, the adults and the parents prepare many different foods – Moon cakes, candies, biscuits, jellies, and fruit, such as grapefruit, longan fruit, bananas, apples, mango and so on. Moon cakes are the specific cakes made only on this festival. Moon cake is made from flavour, meat, egg, dried fruit, pumpkin’s seed, peanut. And it is so sweet and good tasting. Currently, the local people tend to make the cake by modern style. 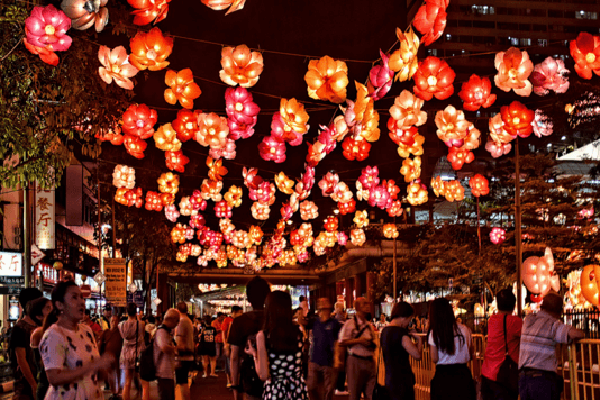 When you come to Vietnam, you will feel the most emotion as the Mid-Autumn holiday is very meaningful. This is an opportunity for members of the family who can share together everything in their year. The young generation express their gratitude to the old generation. The parents show their love for their children. Because the autumn is the time of the beginning of the new school year, so the adults and parents give gifts to the children. Their child will receive a lot of presents with many good luck wishes. The symbol PhD which is made from paper represents good wishes for success to pupils. For others, because the traditional time to have this festival is usually after harvesting the crops, it is as the congratulation for the full harvest. The children bring the lamps around the village. It creates a great atmosphere. Coming the home of local people, you will see the beautiful view as some lamps and decorations. Some will show off their lanterns, others also bring along moon cake to class to share with their buddies. Teachers become less tough and more sympathetic to their students as they recognize the magnitude of the day for the children. Joining the event, you can contemplate the most oriental feature, dragon dancing. It is very interesting. However, in the countryside, you will see the Moon bigger because it is covered by the high building. And you will see the wind blows gentler. This place also keeps more traditional and culture than other. The children laugh wildly in the pleasant whether. Dragon dancers often dance to every household in their village, it is like “treat or trick” in western culture, the dragon dancers will not quit until you give them some lucky money. The main day of the festival is 15th August, however, local people celebrate from 14th August. Actually, the children are excited to prepare for the mid-autumn weeks and even a month before it really takes place. Coming to the countryside, you can remember your memories in the child with joy and happiness, laughters of children far-resounding on the village streets. They are rehearsing for singing and dancing competitions that will be hold during the festival. It is very amazing, the street has been the focal point for the festival. Coming to this place, you can buy something to join the festival. It has huge crowds and colors and surround is the colorful lantern stores on the both sides of the alley. Beautiful lanterns of all types and shapes are in every single store attracting customers and visitors. Everyone passing by the street just can’t help taking home a little lantern. If not, they will at least take some photos of this fascinating spectacle. If you are able to travel to one of the most beautiful old towns of Vietnam, then you will be very lucky. 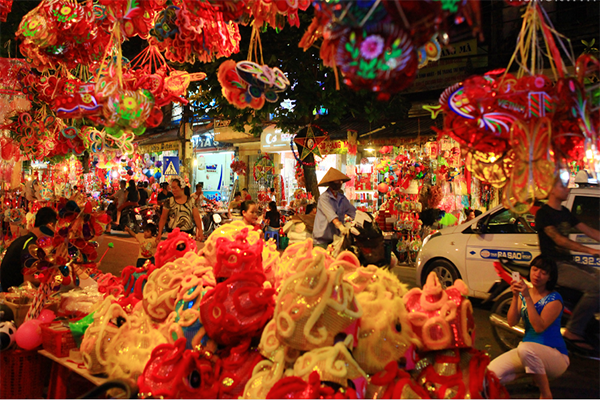 To enjoy the best of Hoian right on the occasion of the Mid-Autumn celebration – it’s a rare opportunity. 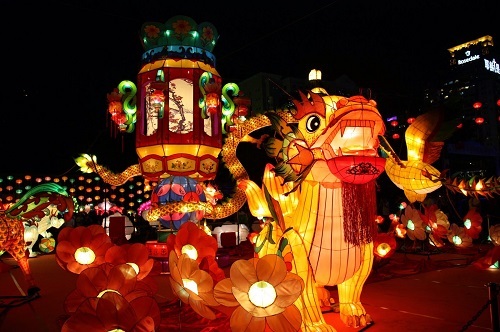 The colorful town lit up by hundreds of thousands of lanterns and floating paper lamps will absolutely amaze you. The stunning magical lights do a great job in wonderfully coloring the streets, houses and even the beautiful Thu Bon river running along the town edge. If you have children, these two cultural theme parks are definitely worth your consideration. These two places are not as big as international giants like Universal Studio or Disney Land. However, for years, they have been one of the most favorite destinations for local kids and their parents during special occasions like Tet (Vietnamese Lunar New Year), Summer Break or Mid-Autumn Festival.